'Alan Vallis at OXO' was established in 1997 on London's Southbank. 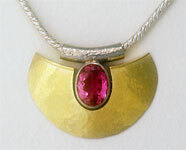 It provides a showcase for Alan's collection of jewellery and a central location for clients to visit. The gallery on the second floor overlooks the OXO courtyard on the south-side of the building.123. For information about Alan and how to locate his workshop, his News-board for last minute details, his forthcoming exhibitions and where to buy his work and a condensed history of the Oxo tower, click Contact Alan. Alan's work has many influences, the result of his travels, to Indonesia, Africa, Jordan and Egypt but particularly the Red Sea. His interest in diving has introduced a recurring marine theme in his work. He has a collection of ring styles. 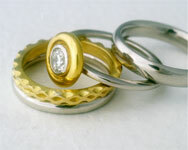 His 'Stacking Rings' are influenced by the decorative patterns, textures and colours of the Middle East. The latest development to this series is the 'Diamond Bridge' feature. His 'Coiled Rings' were inspired by the box construction techniques of the Shakers of North America. In more recent commissions he has been experimenting with settings for large stones in his 'Pevsner' series. Also a new series of 'Loop Rings' which have evolved from an original pierced ring design with small diamonds. He has also been developing his 'Munich Muse' necklace designs, work of a less figurative nature that use strong geometric forms to compliment unusual cuts of semi-precious and gem stones sourced in Germany.